If you want to pick an authentic Malay cuisine, chicken in tomato sauce (Ayam Masak Merah) is the ideal choice for you. 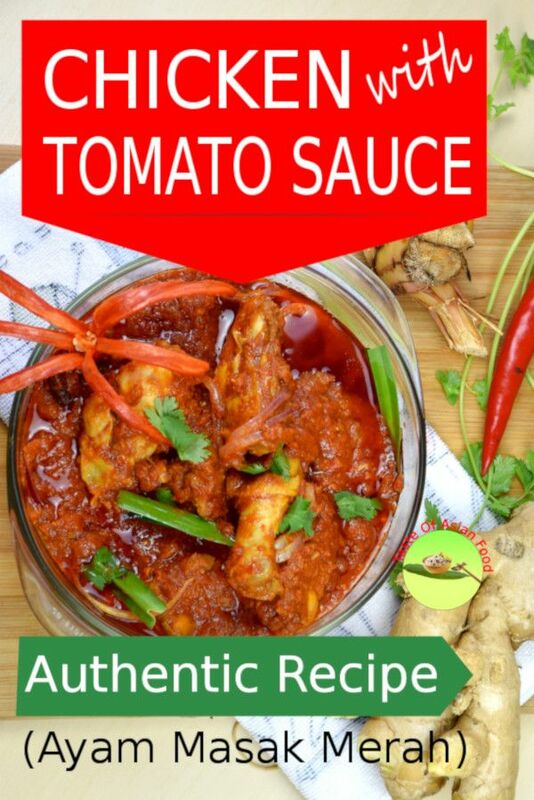 The chicken in tomato sauce recipe has less chili than other traditional Malay cuisines, ideal for the gastronomes who do not withstand other fiercely hot curry dishes and kids friendly. Chicken in tomato sauce has all the characteristic of Malay cuisine- slow cook and with plenty of gravy. The flavor is the result of the complex interplay of various spices. I am going to show you how to bring this authentic Malay cuisine regularly served on the banquet table to your dining table. Let’s dive in and start cooking. Please read my Malaysian tomato rice, which complements perfectly with chicken in tomato sauce. For the gravy – chili sauce, tomato paste, tomato, ketchup, sweet soy sauce, palm sugar, salt, cumin powder, coriander powder, and pandan leaves. Don’t be afraid of the long list of ingredients. It is a matter of getting it organized. I will also mention what are the ingredients you can omit if not available. Group 1- Marinate the chicken. 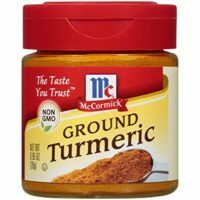 This group consists of three items only the chicken which is bone-in and skin-on large chunks for the authentic recipe, turmeric powder, and salt. (You can use breast to replace the chicken chunks). Mix the turmeric powder and salt with the chicken and marinate for at least half an hour in the refrigerator. Marinating helps to let the flavor penetrate deep into the large chicken chunks. A word of caution: turmeric is a yellow dye which will stick on the skin at least a day. Combine the ingredients with a tong, or a pair of trustable glove to avoid both hands turn yellowish. Experienced local cooks will know that you must have dealt with turmeric when they spot your yellowish hands. There are four dry spices regularly used together in Malay cooking. I call it empat sekawan, which means ‘four close friends’ in Malay. They are cloves, star anise, cardamom, and cinnamon bark. These spices and used in other Malay recipes too. Take a look of the Malaysian tomato rice that I posted not long ago, and you will find the same set of spices are used in the recipe. You do not need to break the spices except the cardamom with the handle of the knife to expose the seed within. 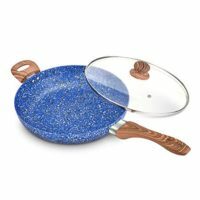 Place some oil in the pan with a heavy bottom. Lightly saute the spices until you can smell the aroma rising from the pan. This group of components give the body of the gravy and enhance the flavor. These are lemongrass, galangal, ginger, chili, and onion. Saute the onion until it slightly brown before combine with the remaking ingredients. Browning the onions make the ayam masak merah more aromatic. You can simplify the step by omitting the browning process, but I find that it is less desirable. Here is where you can make your variation. 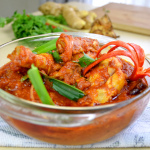 Changing the ratio of the ingredients will affect the flavor of the ayam masak merah recipe. Some local people will include dry chili in the blend to make this spicy chicken tomato recipe really hot. We can get the readily blended dry chili called chili boh from the market. Some cooks will use half red and half green chili, and some spicy-immuned extremist will add the bird’s eye chili without removing the seeds and pith. My chicken and tomato sauce recipe is sort of kids friendly, use only 5 chilies for 1kg of chicken. You can taste the chili flavor minus the hotness that may put some people off. Blend the ingredients with some oil. It is important to blend it until really smooth, as we do not want to have large pieces of galangal and chilies in the gravy. Cut the galangal into small pieces and red chili into short strips as they are the most difficult one to get well blended. The next group of ingredients is the gravy. It has a long list of items but is relatively easy to prepare. Again, this is where you can alter the flavor. There are two items in this section which I need to make a note- tomato and chili sauce. The Malaysian chili sauce has its own sets of flavor as it is more than plain chili. The whole spectrum of ingredients in the sauce contributes to its distinct flavor. You will get a different set of taste if you use other types of chili sauce (e.g. Sriracha, Japanese chili sauce, and Mexican Chili sauce). You may want to give it a try with these chili sauce, but I would prefer to keep it authentic and stick to the Malaysian version. If it is not available, omit it. 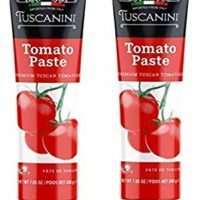 How about tomato ketchup, fresh, and taste paste? Does it make sense to make this chicken tomato stew recipe so complicated? This combination of tomato-related ingredients is the standard for most of the original recipes. I assume this is because the tomato in Malaysia is generally not as sweet as those from the climate country. They tend to be smaller and pale in color. The flavor can be enhanced by using tomato paste (usually imported ) and tomato ketchup. 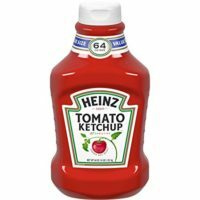 I will remove the tomato ketchup if I have to decide to simplify it, but since I want to present the tested version to you, I would rather keep it as it is. 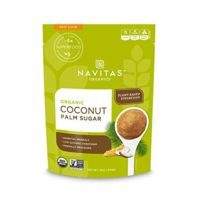 Palm sugar has a caramelized flavor. If you do not have palm sugar, substitute with brown or any other sugar. Cumin and coriander powder in my favorite booster for the chicken in tomato sauce. Some recipes also include Fennel powder. These are all acceptable variation. If you do not have any of these items, omit it. The chicken in tomato sauce may lose some zing, but is a cleaner and laid back version which is more suitable as the everyday meal. You won’t enjoy having food with an overpowering flavor for every meal! Pandan leaf is also called screwpine leaf. It is widely available in Malaysia which can grow quickly. Fresh pandan leaves may be difficult to get in some countries. If you can’t get it, omit it. Do not substitute with pandan essence since it will only add the unnatural taste to the chicken. Most of this essence is made with the artificial chemical with inferior flavor. The soy sauce I refer to is the Indonesian type of soy sauce. This is different from the Chinese soy sauce which it more savory. Again, you can omit it if it is unavailable. You know the long list of ingredients can be confusing, and the difference of flavor without this item is marginal. Deep-fried or not to deep-fried the chicken? 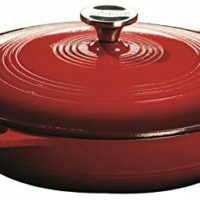 Chicken in tomato sauce is a versatile recipe. There are recipes omit the deep-frying process (luckily have not heard anyone suggest that marination can be skipped too 🙂 ). I prefer to deep fried the chicken to nearly cooked, about four minutes in the oil before adding to the gravy. Deep-frying can significantly improve the flavor. The goal is not to thoroughly cook it so you can stop short at 4 minutes even for a large chunk of chicken. 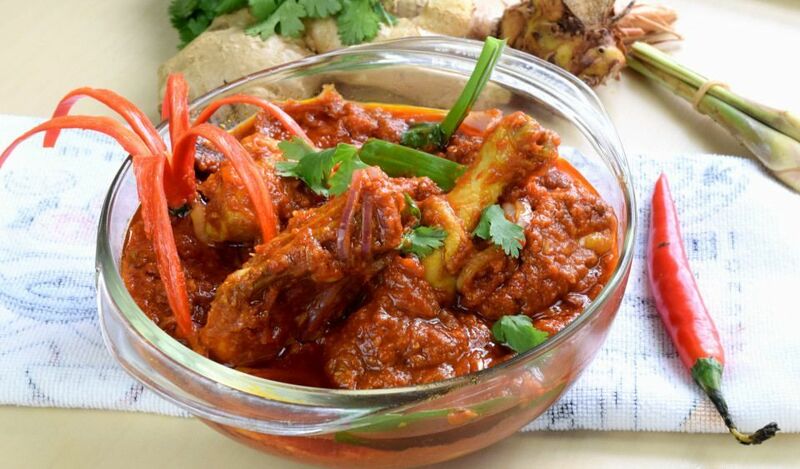 If you want to try and authentic Malay cuisine, Ayam Masak Merah (chicken with tomato sauce) is the ideal choice for you.The chicken with tomato sauce recipe has less chili than other traditional Malay cuisines, ideal for the gastronomes who do not withstand other fiercely hot curry dishes and kids friendly. Mix the turmeric powder and salt with the chicken and marinate for at least half an hour in the refrigerator. Cut all these ingredients (C) into small sections. Saute the onion slightly brown before blend with the remaining ingredients. Blend the ingredients with some oil. After marinating for 30 minutes, deep fried the chicken in oil, until it is nearly cooked. When it turns slightly brown, drain and set aside. Add some oil into the pan. Add ingredients (B). Saute over low heat until you can start to smell the aroma. Add the blended ingredients and the fried chicken. Throw in the pandan leaves. Stew over low heat until the chicken is fully cooked. Add ingredients (D) and reduce the heat to just barely boiled. You may want to add some water but not too much. When the chicken is fully cooked, they will release their juice and dilute the gravy. Simmer over low heat, that is when it is barely boiled, for about 30 minutes. While you are waiting for the stewing liquid reduce to a thick and sauce, cut an onion rings. When the chicken is ready, mix the onion rings with the chicken. Give it a few stirs and dish out. The onion rings will add some contrast and dimension to the relatively dull color of the gravy. Make a chili flower as garnish. Throw in some sections of the fresh pandan leaves and coriander leaves and serve. 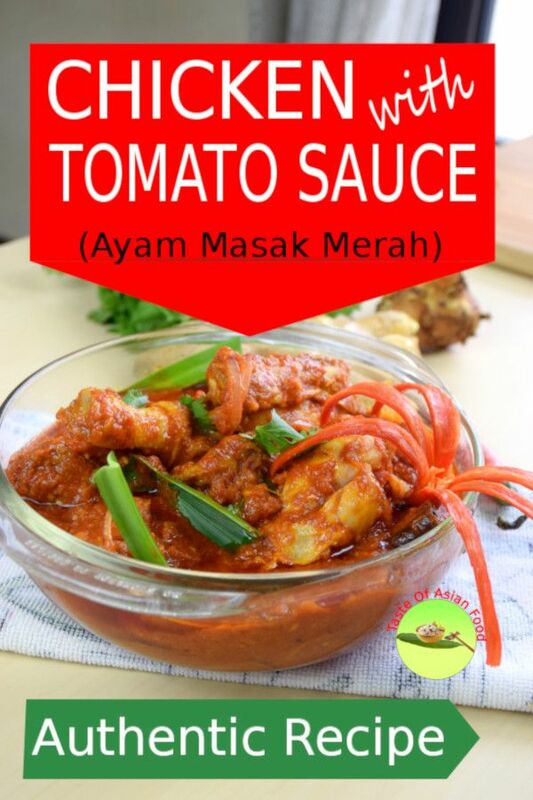 1 Response to "Chicken In Tomato Sauce – How to cook the traditional Malaysian Ayam Masak Merah"